Cousins Jim Tselikis & Sabin Lomac the owner's of Cousins Maine Lobster, came in the Shark Tank with a very unique way of serving up fresh Lobster. 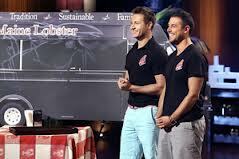 They were looking for $55k investmeent for only a 5% stake in the lobster business on wheels. This puts a very high valuation of over $1 million on such a new and small company, but they were smart enough to feed the Sharks their signature "Lobster Roll" before they got down to business. They have been in business for only 2 months? We'll that's what they said. (and already worth a million bucks?) The cousins have done $150k in sales and needs the Sharks money to invest in another food truck, but they don't seem to eager to give up much equity. Interestingly, they have a general manager already in place for their "one truck"catering business. the business economics but doesn't seem to get the answers he's looking for. The cousins keep getting distracted before finishing Marks questions. Cuban finally has had enough of the casual talk and goes out. Barbara Corcoran says "your starting to act like Daymond, a baby". WHAT? did she really just say that? Daymond responds "are you going to write them a check, referring to Barbara". Barbara responds "pipe down little man". O'she it, it's about ready to hit the fan. Daymond responds back "just because your an old crab, doesn't mean you have to invest in the lobster business". LOL- not bad right off the cuff. Daymond John gets back to business and wants a more realistic valuation of a business that's two months old with only one truck. John asks whats the Cousins Best Offer they would entertain. They come back with "maybe 7% or 8%" with the straightest faces in Shark Tank History. All the Sharks start laughing hysterically. Normally this would be enough to get all the Sharks out in quick fashion. Daymond quickly does just that. Surprisingly Robert steps in and offers them the $55k that they are looking for but wants 25% of the Maine Lobster Business. It's not even an offer the cousins will consider.WOW- you'd think this business would have at least two trucks before talking to the Sharks like that. But it's enough to make the Lady Shark start to circle her prey. Barbara Corcoran quickly strikes and offers them her favorite number 17% for the same money. Robert not to be out done on this brand new business offers $100k because, we'll because he can. The Cousins Tselikis and Lomac want to know what the Sharks can do for them? Barbara was waiting for that question and re-designs the entire brand including the food truck look. Robert is offended that they would even ask him such a question. He seems to want to invest but only if that's all he has to do. He doesn't have anything to prove to them. Robert withdraws his $100k offer. The cousins realise they are down to Corcoran now and asks if she would consider 12% for the $55 grand. She gestures NO. Mark Cuban asks "why are you guys holding on to the equity so tightly?". The cousins reply "Because it's our baby". Cuban comes back with "80% of a watermelon is better then 100% of a grape". So true. Jim responds to Cuban "You said yourself that 5% of something is better then 100% of nothing". Cuban can't argue with that, he's the one that said it. Looks like the cousins did their homework on the Sharks. Barbara Corcoran gets a successful deal with Jim Tselikis & Sabin Lomac for $55k and a 15% stake in Cousins 'Fresh" Main Lobster. An initial valuation of $825k for the company post Shark Tank. The Cousins are already back on the Shark Tank with one successful story to tell within a short amount of time. The deal with Barbara Corcoran did in fact close and she is now officially in the Lobster Business. Sales have exploded from $150k to over $700k and climbing very fast since they were aired on the Shark Tank. When you get a Shark on board big things are bound to happen and this is no exception for the Cousins Maine Lobster Business. With the Brand already in place as THE Place to get guaranteed fresh lobster from Maine flown into California, why not offer everyone fresh Lobster everywhere? That's a Great Idea and now it is a reality from a 7000 sq./foot distribution facility they just opened. The Cousins Maine Lobster Business has been so successful not only as a growing business but as a business that is creating a lot of new jobs in the community. They even received an award from the Governor's Office and the first Award Barbara has ever received for creating new jobs. This is yet another Success Story that is just getting started with many more updates as they continue to build out this Brand. A Franchise Opportunity coming soon? It sure would seem like a logical choice. From Shore to the Door in 24 Hours! You gotta get to the truck early,often they sell out before 9pm! Couldn't decide between the Massachusetts roll or the Connecticut roll so I bought one of each! Um should be Maine lobsta...not mass or con. 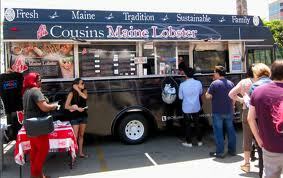 Im from downeast maine and there is no other way than a good old maine lobsta..
have they come to Phoenix, Arizona yet?? Dying to try them!!! They were at the Chandler Food Truck Friday gathering 2 weeks ago. I had a Maine lobster sandwich. I'm back in Chicago, hope they visit here soon. Soooo AMAZING!!! They were in Chandler today at my work. The best lobster roll I have ever eaten. Melted butter over the Connecticut Lobster roll. Oh. My .Goodness!!! SOOO GOOD!!! Was not impressed at all the lobster was piled high but the sandwich was so small anything would have looked piled hig. There was an odd after taste and definately not representative of fresh lobster. We also had the clam chowder for $10 a bowl I think that campbells clam chowder is better. Seafood and chowder are my go to foods and I will not be going back here. We love that there are food truck at our local farmers market in Power Ranch but this one is not worth the hype.